There’s nothing (in our opinion) cooler than a fast wagon at the drags and while the Whackee Wagon that Lee Smith built and drove back in the 1960s and 1970s may not be the fastest thing ever, it is one of the coolest wagons ever built for action on the strip. Constructed with backing from Chrysler, it is powered by a 426, dual quad topped hemi, is fully caged, and is built like every other super stock/modified production car of the era. As best we know this thing was designed and mostly campaigned as a super stocker but we have seen photos of it wearing s modified production designation on the windows as well. The car has been for sale for a while, either that or is has been swapping owners over the last few years because we dug up stories that we have run on it from the 09/10 time frame and they were centered around the fact that it was for sale as well. Hey, there is no shame in that, people are likely buying it and thinking they are going to turn it for a profit. Being that the asking price is hovering around $50,000 now, it is getting pretty steep. So Lee Smith built this car and it was actually a companion car for him to run along side his Crazee ‘Cuda which was a pro stocker. Both cars shared the same cool paint scheme and they both shared semi engines although the pro stocker was more highly modified as the rules allowed. The one thing we are not clear about is when this car was built. Was it constructed between 1966 and 1970 or was is built in 1971 when Smith was doing the pro stock car? It states in the eBay ad that the machine was built by Smith with funding from Chrysler to combat Cobra Jet Mustangs in super stock. We’re not sure if that means it was built in 1968 when the Cobra Jets came out or what. 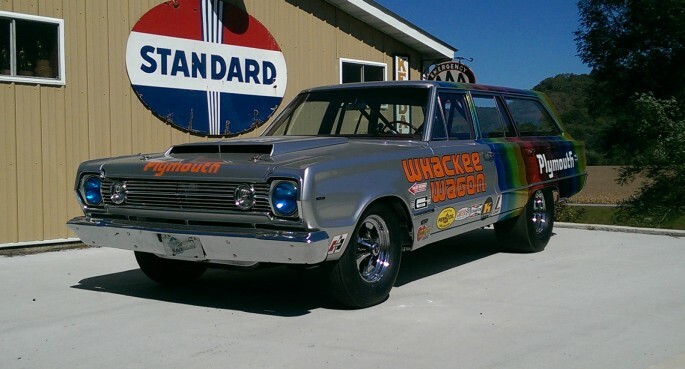 Either way, this is the real car that has been raced all over the country and it is one of the few hemi powered Plymouth Belvedere wagons you’ll ever see. The factory sure didn’t construct them this way! I'm pretty sure EVERYONE agrees that fast wagons are awesome!